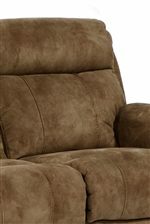 This glider recliner is perfect for when all you want to do is relax and unwind in your home. 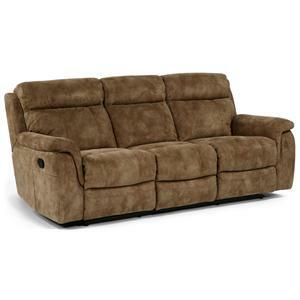 With a padded headrest and pillow arms you'll never want to get up once you sit in this piece. The glider feature allows you to easily rock back and forth for an added level of comfort. A discrete reclining pull built into the side gives it a natural look and does away with the clunky wooden lever that's a staple of most recliners. The Latitudes - Casino Glider Recliner with Padded Headrest by Flexsteel at Hudson's Furniture in the Tampa, St Petersburg, Orlando, Ormond Beach & Sarasota Florida area. Product availability may vary. Contact us for the most current availability on this product. Fabric Options Available in 933-74 as shown. The Latitudes - Casino collection is made to look good and feel good. Padded headrests act like pillows, while the plush arms provide cozy comfort. Decorative stitching adds character and style. This collection features a Glider Recliner, Double Reclining Sofa, Rocking Reclining Love Seat (not shown) and Double Reclining Love Seat (not shown). The Latitudes - Casino collection is a great option if you are looking for Casual furniture in the Tampa, St Petersburg, Orlando, Ormond Beach & Sarasota Florida area. Browse other items in the Latitudes - Casino collection from Hudson's Furniture in the Tampa, St Petersburg, Orlando, Ormond Beach & Sarasota Florida area.